We’ve all heard of breakfast in bed. 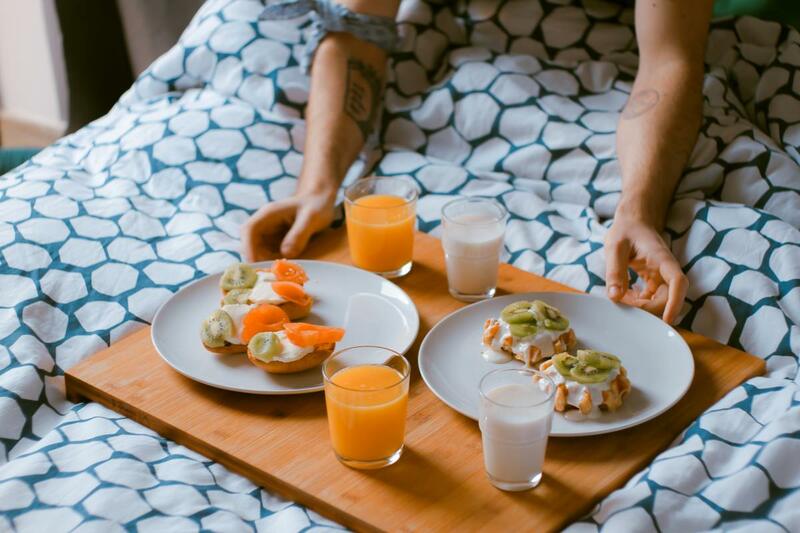 It’s one of the most amazing Sunday morning rituals anyone can have, and an immensely romantic gesture you can ever make to your significant lover should she still be asleep when you awake. It’s so popular, in fact, we’ve all be there, done that and got the coffee stained duvet to prove it. But what if it made more sense to have dinner in bed? We know this sounds a bit crazy, especially if you are still young enough to think clubbing is the best way to spend your evenings. But if you are a fully-fledged, worn-down by life adult, you might want to read on because our dinner-in-bed suggestion is actually a super-attractive idea when you think about it. We all love going out for a meal. It’s a thing that humans crave. The problem is, eating out is expensive, which is where eating dinner in bed comes in. Going out for breakfast-slash-brunch can cost as little as $5, and that’s for a bacon and egg sarnie with a cuppa coffee. But going out for dinner can see you spend $25 on a pasta dish. Alas, it makes way more sense to have dinner in bed. Breakfast in bed pretty much means a) watching the news or b) letting your kids watch their favorite cartoons (which have nothing on the cartoons you used to watch). But having dinner in bed means you can catch up on all your favorite shows - Game of Thrones, Peaky Blinders, Hi-Lo Joe, Power. You need to eat and you need to get your Netflix-fix, which dinner in bed does, simultaneously. Because you constantly complain about not sleeping well, you were urged by your best friend to find out from Mattress Guides what the best, most comfy mattress was and to start getting early nights more often. Well, that’s what dinner in bed encourages. You get to enjoy your new mattress, chomp on some tasty grub and then fall asleep at 9.30pm (if you’re feeling brave). We’ve never come across an article that says, “a coffee a day keeps the doctor away,” but every so often we’ve come across an article promoting red wine for health reasons. This means you’ll be treating yourself in more ways than one. And then, when that warm, fuzzy feeling set in, you’ll be right where you want to be. On second thoughts, maybe stick to white wine in bed. Or, better yet, a delicious cocktail, homemade and everything. Everyone that has ever scrolled through Instagram first thing in the morning will know just how aesthetically pleasing a brightly colored cup of OJ, a mountain of honey-drizzled pancakes and a bowl of sliced fruit looks when placed a-top clean white linens. But it’s been done so many times. What would be deliciously novel is swapping that food for a big, juicy cheeseburger - with bacon - and a glass of white wine to boot. It’s guaranteed to rack up more likes than your mate’s brekky.